In this podcast episode, we're learning what it's like to be a student at one of the top culinary schools in the country, and we're visiting two local lunch spots that are making their mark with sandwiches. 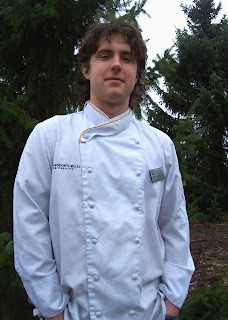 First is our interview with guest Keith Seeber, a Finger Lakes native who recently graduated from the renowned Culinary Arts program at Johnson & Wales University in Providence, RI. We'll talk with him about what it's like to study food and cooking at professionally, and discover what makes a culinary degree program valuable in the kitchen. We also have two dining reviews this week, as our journey through every restaurant in Ithaca A to Z brings us to two places starting with the letter "J" - JJ's Cafe at Community Corners in Cayuga Heights, and Jimmy John's Gourmet Sandwiches in Downtown Ithaca. Both specialize in sandwiches, but one of them has a personality and neighborhood spirit all its own. For continuing updates on everything we're doing, be sure to follow us on Twitter and on Facebook. We'd also love to hear from you directly: write a comment on the blog, leave a message on our voicemail line 607-216-8624 (607-21-MUNCH), or send an email with your thoughts to: feedback [at] eatingithaca [dot] com. Stay in touch and keep Eating Ithaca! There's some Sandwich Shop spread news: I've heard that JJ's Cafe may be getting Miracle Whip! The only other sandwich place in Ithaca that has it, to my knowledge, is the Short Stop. I tried the Wednesday&Friday special today: The BBQ Pork Melt. I'm thinking this just might be the best of its kind in Ithaca, currently!